Fayth Lore sporting her T-Shirt for this year’s True Purpose Conference. Fayth Lore speaking and teaching at one of her conferences. Friday evening a group of close to 500 girls(and ladies) will gather together to hear some wonderful words of encouragement from a young lady herself, Fayth Lore. 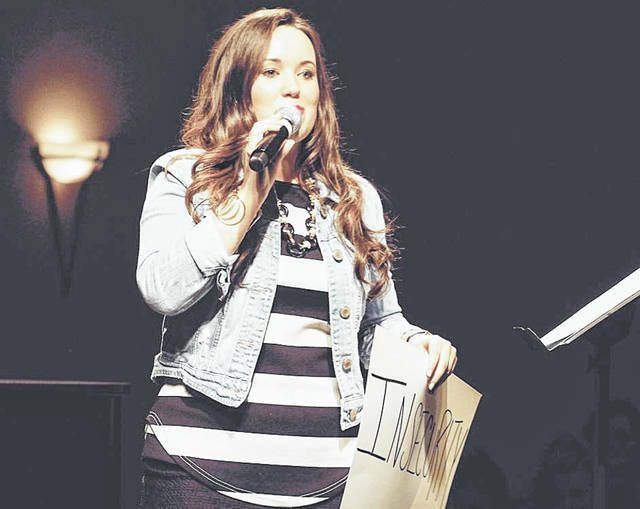 The Lore Family Ministries will host the seventh annual True Purpose Girls Conference on March 29, from 6-8:30 p.m. at 12138 Gallia Pike Wheelersburg, with Lore being the director and keynote speaker. In its 7th year, Lore has been the director and keynote speaker, she said, “We don’t sell tickets it is a free event for girls ages 10 and up, we do ask if they could register online, so we can get an idea of how many to expect. Some people will not register until the night of the conference and we will do that also. When we started out, we had just at 100 people and we already have 440 registered for this year.” This non-denominational event, “Our doors are open to everyone,” she said. This year’s theme verse is: Romans 8:37 -Nay, in all these things we are more than conquerors through him that loved us. 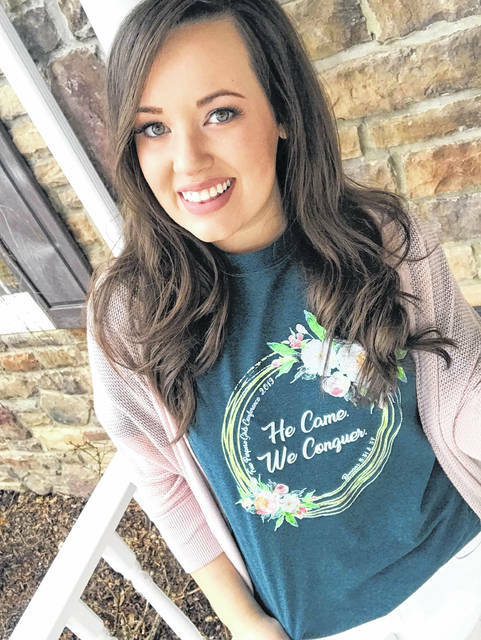 They are selling T-Shirts for the conference that say, “He came, We conquer.” Lore said that they had definitely not ordered enough, but they will be selling more. Lore also said that with the 400 plus girls in attendance, there will be over 40 churches represented. On Friday evening, Lore will serve as the keynote speaker and her brother, Samuel Lore will lead worship, and several of his friends will join him on the stage. Levi Nelson will be on piano, Eli Reffit will be on guitar and vocals, Jacob Perkins will be on the bass and Ryan Jones will join them as a vocalist in the worship band. Also set to perform is Glow, a team of dancers made up of Tori Reffit, Tiffany Porter, Autumn Lewis, Kaeli Easterday and Isabella Reffit. They have a special glow in the dark performance. They will be performing two songs this year. There will be a drama team- Expressions of Grace, they do dramatic sign language to Christian songs. And not to be left out, Lore said that there will be several prize giveaways. Every girl will leave with something to take home from the conference. The Lore family is from Minford and are known to many in the area. Fayth with her conference is just another outreach that this wonderful family does, to touch different people in their many walks of life, whether it be in song or spoken word. The registration Link can be found on the Lore Family Ministries Facebook page or website at: www.TruePurposeGirls.weebly.com.